I recently completed my thesis for my Master's in Industrial Design. I am still working on breaking out individual projects for easier consumption. For now, please feel free to take a look through my thesis book. As a creative discipline, design works to instigate change. Often, a design’s success hinges on effecting a change in a user’s life, whether that be prompting the user to accept a new way to communicate, provide care, or share resources. A well-designed product can be offered to a user, and even acquired by a user, yet never be integrated into their daily life. This abandonment may be due to a flaw in the product’s function; however, it can also be due to a lacking system of support for the user while they are integrating the product into their life. In the case of a new product or service, a lack of integration means that the user leaves the offered solutions behind. With the goal of understanding how to bridge the gap from change to acceptance, I set out to learn from people who are navigating extreme moments of life transition. I looked across three examples of pivotal life changes: adolescent immigrants starting at a new high school, young parents returning to work, and older adults moving to a new community. After identifying an opportunity for impact, I focused on designing for families navigating the transition of integrating parenthood into their professional lives. I chose this transition because it is multifaceted. Changes in child care create adjustments for both care providers and children. This thesis presents a model that designers can consider when creating tools to support people through a transition. It then demonstrates how to apply this approach by designing to support parents transitioning back into professional roles. The outcome of my research was this model for designing transitions on the left. The type of assistance people need during their transition process rotates through guidance, respite and control. The model can guide designers to create products for people in transition that provide an introduction (guidance), offer a moment to pause from the new experience (respite), and finally give options for ownership (control). Products that meet these needs facilitate acceptance of the transition. 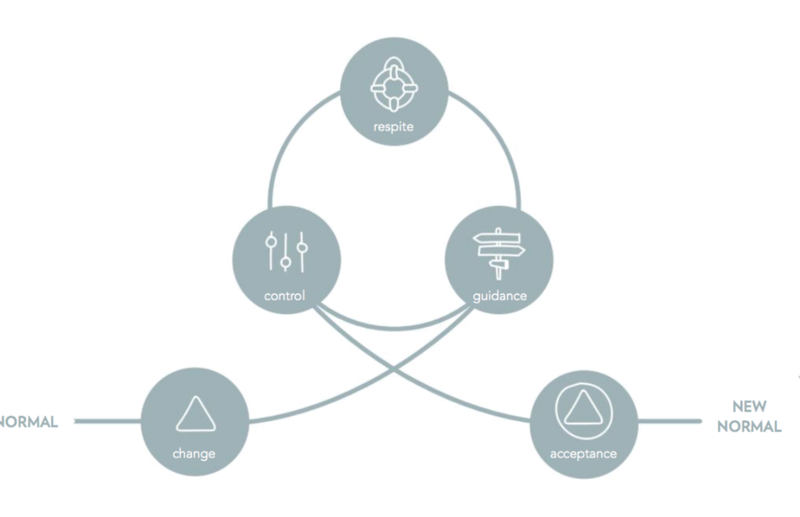 There are options for how design can offer support at each phase of the model.